"This is a superb icing and does not take long to make." Combine the butter, lemon juice, vanilla, and confectioner's sugar and beat until light and fluffy. Add more confectioner's sugar, or lemon juice to adjust the consistency as needed. I halved this to use with a lemon box mix cake. It was really sweet! I mean REALLY sweet! It didn't spread too well, either, as it was really thick. Very nice frosting. Used it to ice a lemon sheet cake. 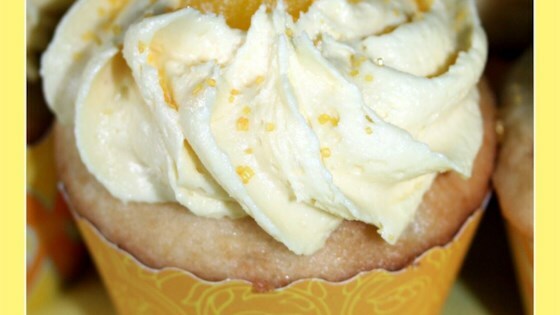 If you want a really lemony taste, use lemon extract in place of the vanilla, or do half vanilla and half lemon. This is a keeper. Sure you may have to add a little extra lemon juice or, as I did, a little milk...icing is like that..this icing is lemony and not too sweet. i added more lemon juice,then called for,and it was divine! i used it on top of the glorious sponge cake also on this site. will use this icing again,thank you! This is really good icing. I add more lemon juice which gives it a kick.